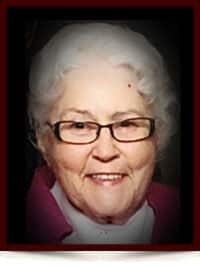 Mary-Ann Eva Lingrell - Edmonton's Burial & Cremation Professionals | Trinity Funeral Home Ltd.
Mary-Ann Eva Lingrell was born December 6, 1930 in Red Deer, Alberta to William and Evelyn Reeves (Forrester). She was the third of four children born to William and Evelyn. She had two older brothers, Charlie and Ross, and a sister Sarah. Evelyn suddenly passed away in 1936. William later married Hilda Reeves (Mitchell) and gave Mary-Ann two more brothers, Harold and Gordon, and another little sister Jeanine. Mary-Ann was raised in the St. Lina area and met Lyle Lingrell in 1947 in Lacombe. The two courted for several years before marrying on April 11, 1949 in Edmonton, Alberta. The two had six children: Lyla, Wayne, Dwayne, Randy, Dawnna-Lee and Kevin. Lyle and Mary-Ann lived in many communities, including St. Lina, Golden (B.C. ), Bowden, Red Deer, Grande Center, Lindberg, Calgary, Carstairs, Vulcan, Wetaskiwin, Innisfail, Rocky Mountain House, Thorsby and Leduc. Mary-Ann was a devoted wife and mother who worked as a seamstress, cook and as a nurse for 25 years. Mary-Ann passed away June 28, 2017 in the Leduc Community Hospital with Lyle and her family at her side. She is pre-deceased by her mother Evelyn, brothers Ross, Charlie and Harold, her father William, stepmother Hilda and grandson Michael. She is survived by Lyle, her devoted husband of 68 years, her children and their spouses: Lyla (Ray), Wayne (Martha), Dwayne (Barb), Randy (Susanne), Dawnna-Lee (Miles) and Kevin (Stacey). Brother Gordon (Marlene) Reeves and Sister Jeanine Reeves. She also leaves behind 16 grand children and 30 great-grand children. 4815 47 Street, Calmar AB. I want to offer my condolences to the family, especially to Dwayne and Kevin. My thoughts are with you although it has been a year and a half since your mother has passed.